It was not deliberate when I made an Indian and an Italian dish for a meal. Actually, no thought was given to the combination at all. All I was interested in was having a starch and a protein for a meal. 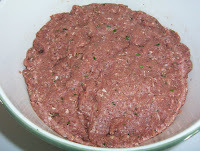 I made potato roti (aloo paratha, aloo roti) and Italian meatballs using the recipe of New York Times' Kim Severson. Email me if you need the recipes. 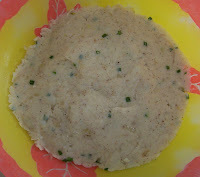 Seasoned mashed potatoes to be stuffed in roti dough. I sauteed my aromatics before adding them to the mashed potatoes and instead of garam masala, I used ground cumin (geera). 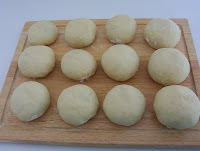 Roti dough stuffed with seasoned mashed potatoes before they are rolled and cooked. 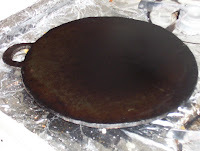 This is what I cook my roti on, a tawah. It is also known as a flat iron-griddle. 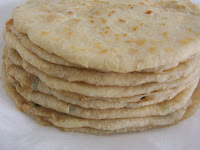 I used regular all-purpose white flour instead of whole-wheat flour which many recipes call for.